At the invitation of the Croatian President Kolina Grabar-Kitarovic, her Serbian counterpart Aleksandar Vucic came for a two-day visit to Croatia, in an attempt to start resolving some of the most painful issues in the relations between the two countries and boost economic ties. "Unfortunately, relations between Serbia and Croatia are burdened by the past. Unfortunately, that past is still preventing us from being able to describe the relations between our two countries as friendly, but it is our obligation to meet and talk and find common interests," Croatian President Grabar-Kitarovic said after talking with Vucic. Both Croatia and Serbia, she added "share common responsibility for the future of southeast Europe." Vucic said he came to "discuss all our open issues, which are many." "In the next one hundred days we will try to change the atmosphere," said the Serbian president at a joint press conference. Both presidents acknowledged they still disagreed on many issues, including the Danube river border between the two countries. 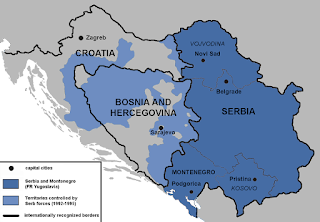 Of the 262 km border between Croatia and Serbia, 136 km are along the Danube River. Grabar-Kitarovic and Vucic agreed that Serbia and Croatia would try to resolve the border problem in the next two years, or turn to an international court for arbitration. Last week, European Commission President Jean-Claude Juncker told the members of the European parliament in Strasbourg that no country from the Western Balkans would be able to join the EU without resolving border disputes.